This Ole Miss college needlepoint canvas is 5" x 5" on 18 mesh. Go Rebels! You can purchase this college needlepoint design canvas-only or with your choice of fibers - see the drop down menu for options and prices. The cotton is DMC floss; wool is Bella Lusso; Silk is Planet Earth Pepperpot. 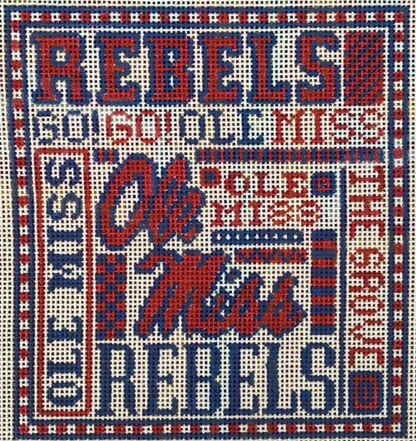 For questions about this licensed Ole Miss college needlepoint design please contact us. We are always glad to help.